I am a romantic, a dreamer and a true lover of fairy tales. Implausible happy endings are the best part of any story and if there's a little mystery and magic thrown in, even better. In real life however, I am a bit more pragmatic. I don't usually play the lottery, believe in get rich quick schemes and if something seems too good to be true, I generally pass. However, when my friend Deb mentioned her Italian Prosperity Jar, I found myself mildly intrigued. ...but this is not a novel ~ in my case a poorly written one ~ this is shopping on Monday, carpooling on Tuesday, piano on Wednesday. You get my drift. There is no room for magic in my world. And then I thought, why? Why exactly is that and when did the magic go away? As a child, I remember summer vividly. It was full of wonder, bugs that made light, flashing light no less, and mysterious noises that emanated from the wooded night. There were mermaids in the ocean. I am sure that I saw a fin and if I could just get her attention, she would make me a mermaid, too. There were sprites in my backyard, gnomes under the ivy patch, the ducks in the big field understood me when I spoke to them and someday, I was going to marry a handsome prince, after outsmarting the evil witch and we were going to live in a cottage. Castles were never my thing ~ too big and cold. Well, the handsome prince/ cottage thing came true...even had to battle a few witches to claim my prize, but somewhere along the line, the magic disappeared. Oh sure, it came back every summer when the kids were little, but as teens, the only thing that they are enchanted by is the combination of cash and car keys. In an effort to regain some of that summertime supernatural, I decided to whip up a jar of prosperity and believe in the possibility of possibility. It was a quick DIY and an opportunity to buy bourbon and kale, two items I have never stocked. Of course, the little man in the grocery store had to show me exactly which bunch of greens were kale. I doubt romaine would work. I grabbed an empty old mason jar from a Mother's Day Sugar Scrub and washed it out. 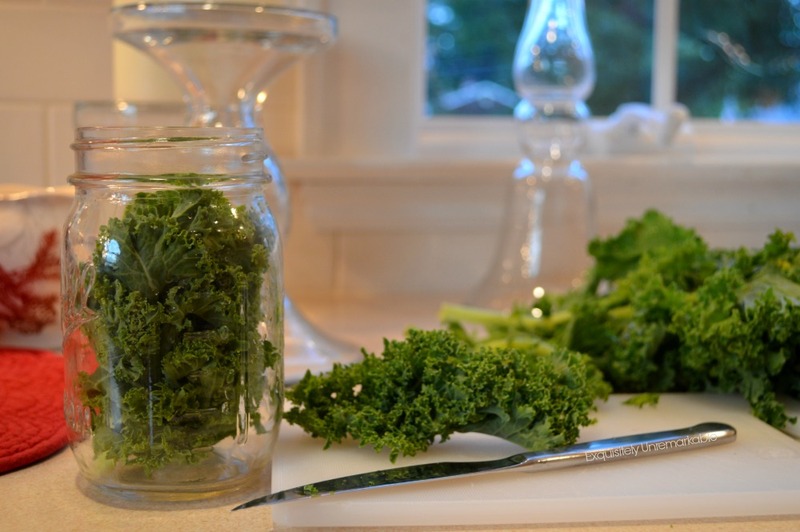 Then I chopped the kale into pieces about the size of my hand and placed them in the jar. 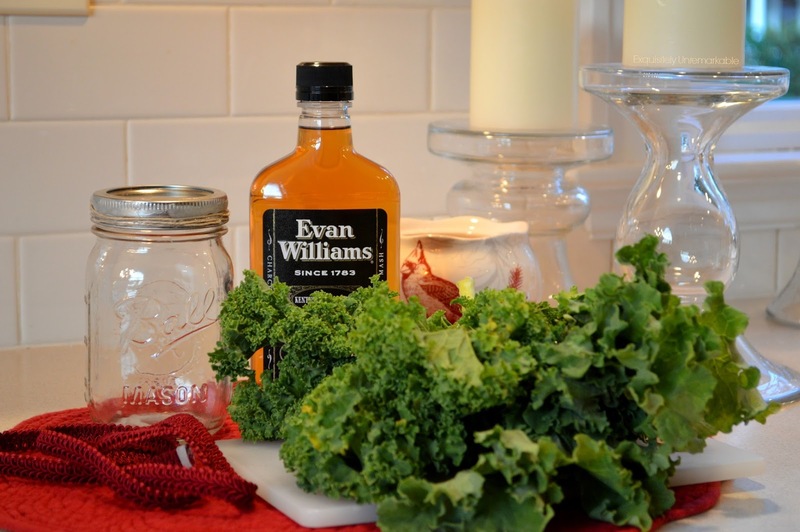 I opened my bottle of bourbon, sniffed, gasped (I'm a total lightweight) and poured it over the kale. I put the cap back on and since it was going to be in my kitchen, I added a red piece of trim to the top of the jar to accessorize it. Nobody said that prosperity couldn't be pretty. When it was done, I gave it a good shake and put it in a sunny window. Apparently, a good shake every now and then is key. 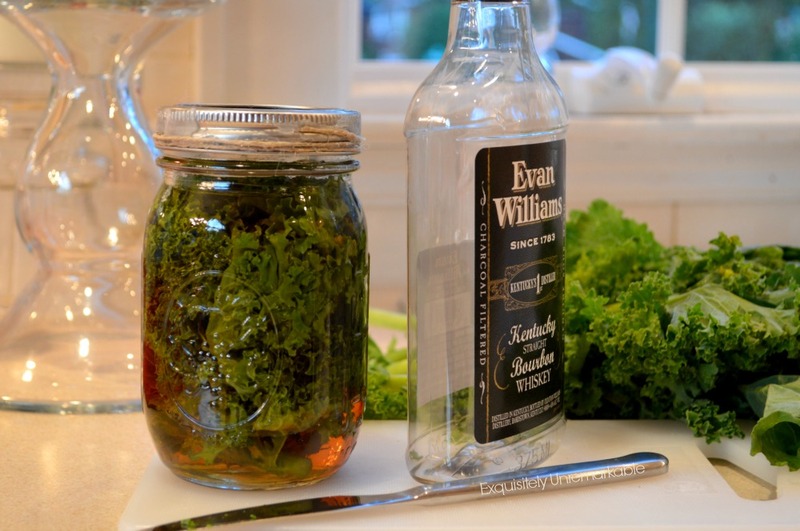 For the full tutorial, you must stop by and visit Deb, plus she has a great recipe for all that leftover kale. Now, I don't know what your definition of prosperity is, but about a half an hour later, this was the view in my kitchen. I'd say that's pretty magical and prosperous, wouldn't you? 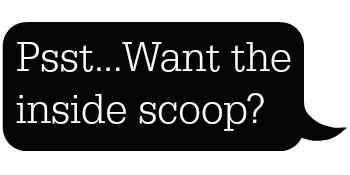 Tips, Tricks, Crafts and Giggles delivered straight to you! Good Luck Kim hope this brings you lots and lots of prosperity! Looks pretty. Thanks Kris! It was something new and fun to try…and thanks for noticing the “pretty”. 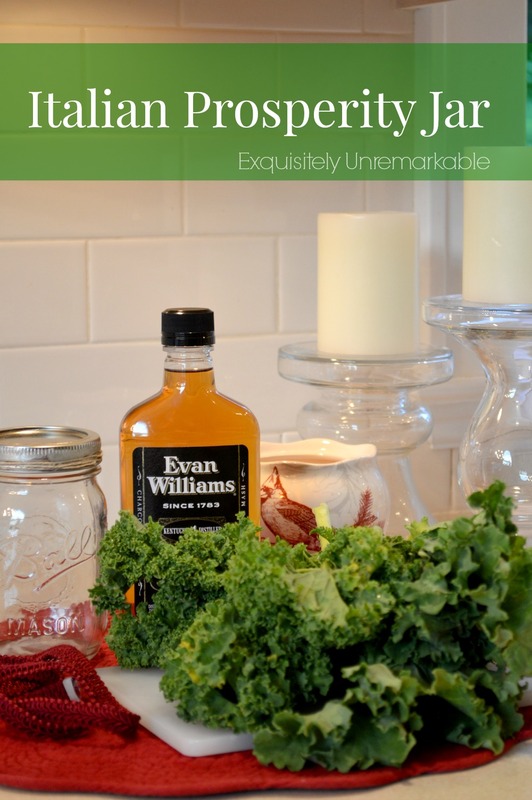 I just couldn’t have an unadorned jar! Ha! I lost my magic too but I wish I had it back! I loved your post and the ladybug, rose photo is wonderful! Oh Gigi, I hope you find some magic. I think your creations are magical...especially those new crowns! Oh Kim I love this idea and I've never heard of this before! 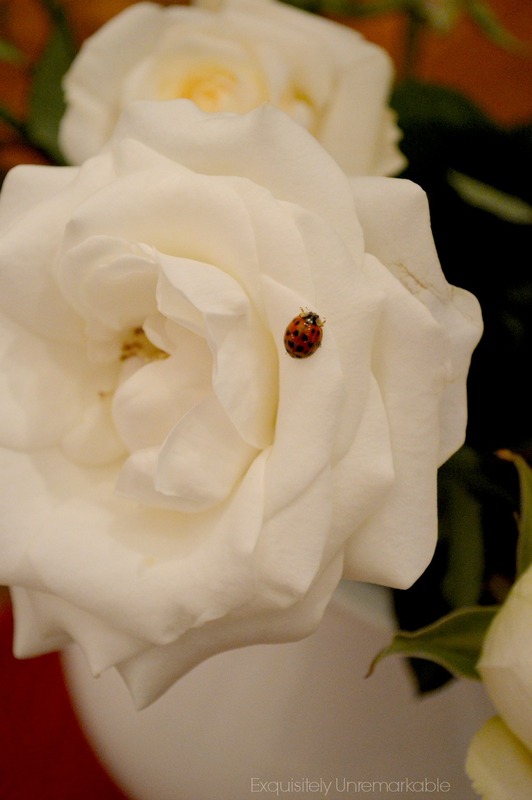 I can't believe there was a ladybug on your flowers! I will check out your friends blog when I get a chance! Have a nice weekend! The ladybug visit was lovely, Julie, thanks! It’s always a fun sign of summer! Oh yes ~ I believe! To me that little bug was a sign. I don't think we should ever give up dreaming. Sure we have to be responsible and adult like, but a little bit of magic never hurts. Great post. Really enjoyed it! I’m with you, Susan, a little bit of magic is good thing! I LIKE IT THOUGH :) And YES, I think everyone needs a little magic in their lives. Hi Kim, Being half Italian I know why not try it. Look how pretty it looks too. Wishing you best wishes with this and hey a ladybug is good luck so it could already be working. Love your pics and the rose is gorgeous. Thanks for sharing and the link. I really like that ladybug shot, too! It was a sweet moment and I am so glad I had my camera handy! So cute Kim. Hey, we need all the help we can get right? It must already be working because you got a little sign. :) Hope you have a great weekend. Thanks Kristi. She landed in the perfect spot...and of course, I had my camera ready! The life of a blogger...ha! I am going to have to make me one. We really need prosperity now. 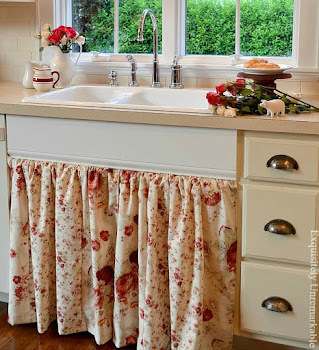 Love that red and white jug. You are so fun. :-) I think it will work...keep me posted. I love the ladybug on the rose. Beautiful. I would certainly say that is magic...at least to me. And, it's only been a half hour!! I think kale is in that wonderful soup that I love at the Olive Garden...with the sausage and potatoes. So that's what I would do with the leftovers. Except...I've tried one or two of the mimic the restaurant recipes posts and still have not gotten that soup right. Still looking for THAT magic lol. Yes, I have tried to copy Panera's mac and cheese and it just does not take the same! I have never heard of this but am totally intrigued! Will make one and see what "shakes" out! ;-) Hope you are having a great weekend! Haha! A great post Kim. No I am a practical minded woman but I hope it works for you. Hahaha. 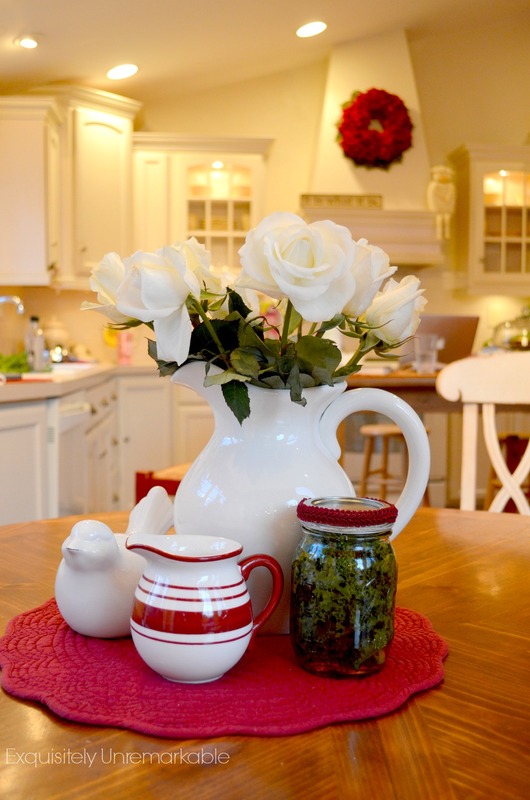 Love the red trim on the jar. You're such a girly-girl. I love you! This will sound really dumb, but I've always loved buying lottery tickets. For $1.00 I could spend a week dreaming of all the things I could do, places I could go, and people I could help. I don't think I've eve won more that $3, but I did get a lot of dreaming for my waste of money. However, working for a law firm, I did know of 3 people who won nice size lotteries so I guess it does happen. I don’t think it’s dumb at all Barbara…like they say, you’ve got to be in it to win it! My husband likes the lottery and plays, frankly, so do most people I know. It’s not a waste of money if you enjoyed in some way and it sounds like you did…do. Hey, today a cup of coffee costs more than that and all you’re getting out of it is a trip to the ladies’ room! ;-) I say enjoy your chance and dream! Yes I do! I need to whip up some for me as well! Love your narrative Kim. Have you ever considered writing a book? I would love to Vel, thank you! I am actually working on it in my spare time. You just made my day! I think that is delightful, Kim! I'm not sure I believe in "magic," but I do believe in the power of positive thinking, positive imagery and positive affirmations. Maybe that is magic. Kim, you are too cute! I do believe in magic and fairies and sprites still reside in my garden. I think the older I get I'm living my second childhood. lol! Loved your cute story!! I have a ton of kale growing in my garden. I'll have to visit your friends blog and see the recipe. The Prosperity jar sounds fun, but I wonder if it could be used in cooking somehow. Thanks for sharing with SYC.